Discover New Zealand in style. You’ll see all the major sites over ten action-packed days. You’ll visit the finest wineries, including Cloudy Bay. You’ll be staying in luxury accommodation and eating gourmet meals as listed throughout the trip. One of the highlights of this trip will be a flight over Milford Sound on a light aircraft. You’ll also sail along the vast fjord which is surrounded by vast waterfalls and rainforests. Over in the “Adventure Captial” of Queenstown, you’ll be able to try your hand at a range of adrenaline pumping activities. This trip offers the ideal combination of luxury, culture, cuisine and adventure. The International Date Line is an invisible line running along the Pacific Ocean that determines when a calendar day begins and ends. Flights to New Zealand cross this invisible line so you can lose or gain a day as you arrive, essentially turning you into a time travellers. So, the first day of this trip could actually be the second day! It depends where you travel from. When you’ve proceeded through customs head to arrivals. Your driver will meet you and transfer you to our luxury hotel in the centre of the city. You’ll have some time to unwind after the long journey. We’ll have a welcome dinner later in the evening and discuss the adventures we have planned. This morning we’ll travel by coach to the Glow Worm Caves in Waitomo. The soft glow of thousands of glow worms light up the cave and create a sense of wonder. We’ll head to the beautiful Cave of the Spirit and explore a series of chambers. You’ll see speleothems and fossil remains. Later, we’ll drive to Rotorua which is built on an active geothermal field. It’s surrounded by geysers, mud pools and hot springs. 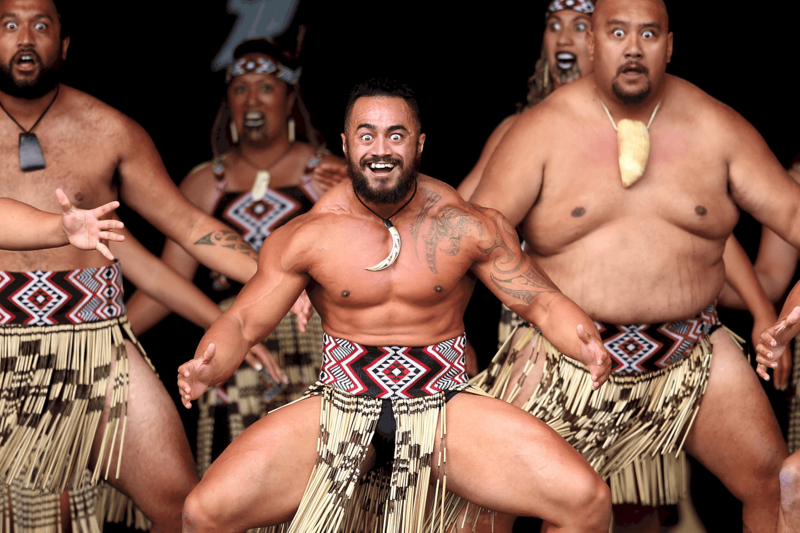 It’s also the cultural heart of the native Maori culture. We’ll then check into our hotel, a luxury oasis from the bustle of Rotorua. This morning we’ll visit Te Puia in Te Whakarewarewa Thermal Valley. Surrounded by gushing waters and bubbling mud pools, this is a spectacular place to explore. Our guide will show us the traditional arts and crafts maintained by the National Carving and Weaving Schools. You’ll be able to discover Maori culture on a private tour of Ohinemutu. After a traditional welcome, we’ll be regaled with tales of Maori history. Keep an eye out for bubbling bud and geysers gushing on the sidewalks of Ohinemutu. Morning transfer to Rotorua airport where we’ll catch a flight to the sunshine capital, Nelson. Surrounded by rugged mountains and golden beaches, this the centre of New Zealand’s arts scene. It’s a one-hour transfer to our accommodation in Nelson. We’ll be staying in the bush in a luxury eco-resort with panoramic views of Abel Tasman National Park and Kaiteriteri beach. Evening at leisure to explore this stunning area. This morning, we’ll be sailing into the park on a luxurious vessel. Our guide will teach us about the impact of early settler activity and Maori history. There’s so much vibrant flora and fauna to see here. You could try your hand at kayaking in the sandy bays of deserted beaches. We’ll have lunch during the day on board – it’ll be prepared by our skipper. This morning, we’ll be driving to Blenheim along the Richmond ranges. Some of New Zealand’s finest wines are produced here. There are over 70 wineries and many boutique breweries. The wonderful cafes and restaurants fo Marlborough truly make this place a gourmet’s paradise. We’ll have a gourmet lunch at a local winery and go for a wine tasting session at the fabled Cloudy Bay Winery. Cloudy Bay helped to put New Zealand wine on the map. It really goes down a treat. We’ll be staying in luxury accommodation in the heart of the wine region. It’s an ideal base from which to explore the local attractions. Today we’ll be flying to the adventure capital of the world, Queenstown. The list of adrenaline pumping activities really is unbeatable. Our centrally located hotel overlooks Lake Wakatipu. Evening at leisure to explore the local bars and shopping areas. 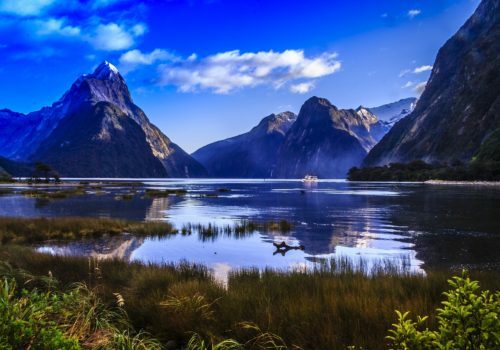 The vast fjord of Milford Sound is a must-see when you’re in New Zealand. It’s flanked by rainforests and vast waterfalls. Known as the eighth wonder of the world, it’s quite a sight to behold. We’ll fly by light aircraft over the alpine scenery. Boarding a luxury vessel, we’ll cruise along the fjord to the Tasman Sea. Our guide will provide comprehensive commentary throughout the trip. Bring your camera as we’ll be passing incredible scenery. Later that afternoon, we’ll brave the famous Shotover Jet – the finest jet boat experience. You’ll get a real adrenaline buzz as we surge along the Shotover River Canyons. Outcrops, boulders and canyon walls will whizz by as we skim shallows just centimetres above the water. Enjoy a day at leisure in Queenstown. There’s no shortage of things to explore. You could cruise Lake Wakatipu, visit a gold mining village, visit some native wildlife, play golf – you name it, there’s a lot to do here! If you’re looking for something more laidback, you could go for a wine tasting session at the Central Otago wine region. Today you’ll be transferred to the airport for your return flight. Your epic New Zealand adventure draws to a close.